In the context of personalized medicine, this design is used when the biomarkers are only putative or not known at the beginning of a Phase II trial and is also useful when there are multiple targeted treatments and biomarkers to be considered. It aims to test simultaneously both biomarkers and treatments while providing more patients with effective therapies according to their biomarker profiles. Outcome-adaptive randomization is sometimes included under the umbrella of “Bayesian clinical trials” but as criticized by Korn and Freidlin (2011), there is nothing inherently Bayesian about it. The process starts with the biomarker profile assessment of all eligible patients and then according to the profile of each individual, the study population will be assigned to the different biomarker groups. Due to the fact that at the beginning of the trial we do not know the true disease control rate (i.e., the proportion of patients who demonstrate response to a treatment) the trial begins with equal randomization so that each treatment by biomarker subgroup is composed of at least one individual with a known disease control status (whether the patient will experience progression given a certain treatment). Next, the trial continues with adaptive randomization of patients; this is achieved by using the Bayesian probit model to calculate the posterior disease control rate. After the posterior rate is found, we define the randomization rate as the posterior mean of the disease control rate of each treatment in each biomarker-defined subgroup. The adaptive randomization process continuous until the last individual is enrolled and can stop early only in case that all treatments are dropped due to inefficacy. Note: Whereas in many trial designs the baseline covariate (in this case the biomarker) is considered as prognostic, the design proposed by Zhou et al. (2008) allows for modelling the treatment by biomarker interactions where the biomarker is in fact predictive. The incorporation of the above hierarchical Bayesian structure allows ‘borrowing strength’ or information-sharing across patients receiving the same treatment but with different biomarker profiles, Zhou et al. (2008). Can result in high probability of success of the trial as there is increase in the number of patients who receive effective treatments. Can make incorrect decisions in case of incorrect biomarker selection as the design is based on the accumulated data about how well the biomarker performs. Likely to introduce bias due to time trends in the prognostic mix of individuals enrolled to the study. European Medicines Agency. Reflection paper on methodological issues associated with pharmacogenomic biomarkers in relation to clinical development and patient selection London; 2011 [updated [cited 2012 Jul 3]; cited 2015 10 Oct]. Available from: http://www.ema.europa.eu/docs/en_GB/document_library/Scientific_guideline/2011/07/WC500108672.pdf . Description: The Bayesian Covariate Adjusted Response-Adaptive Randomization (BCARA) which combines a Bayesian, an adaptive and biomarker classification approach aims to match patients with the most efficacious treatments by utilizing patient’s biomarker information becoming available during the conduct of the clinical trial. It is also considered as a response-adaptive randomization strategy as the allocation of the study population depends on the responses of previous outcomes. A partial least square logistic regression approach is conducted to determine adaptively predictive biomarker-defined subsets. Application: This strategy may be useful in the explanatory phase II setting of the drug development . 2. A fter each new individual has been enrolled in the study, predictive biomarker-defined groups are determined by utilizing a partial least squares logistic regression strategy (PLSLR) which can predict whether the patient can benefit from the treatment. 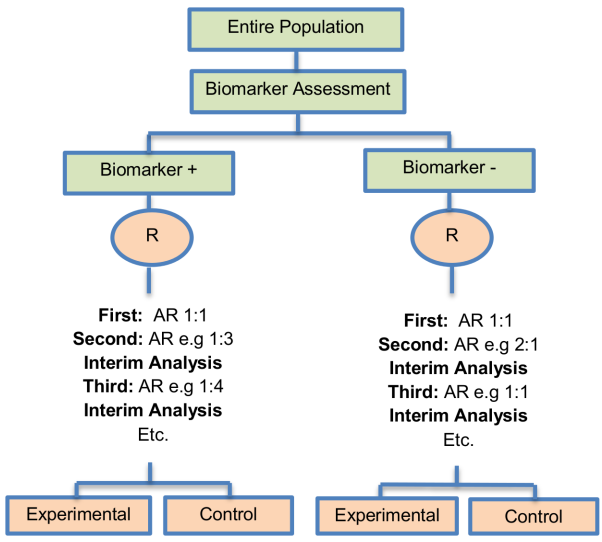 The biomarker status is determined before the randomization . 3. A fter the establishment of the biomarker status and biomarker-defined groups of each new individual, the individual is then randomly assigned into one of the treatment arms using a BCARA randomization . Ability to incorporate prior knowledge from biomarkers into the design. Identification of the subgroups for which a particular experimental treatment is more effective. Can result in reduction of the number of patients required when compared to alternative designs (i.e, non-adaptive trial designs). Solves the issue of the incorporation of information of multiple and possibly correlated biomarkers. The Type I error is not controlled in the traditional sense. An independent Phase III study focused on the selected biomarker-defined subgroups is required to show that the identified promising result is definitely true.